The Suntory Group conducts a wide range of social contribution activities based on its spirit to give back to society, but a relationship between society and every Group employee is also important. We actively support volunteer activities and other events for employees to participate in society to continually cultivate sincere human trust toward Growing for Good. 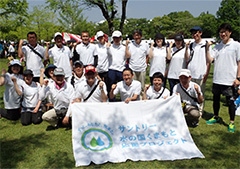 As part of this support system, Suntory established the Volunteer Leave Program and has participated in a variety of activities. 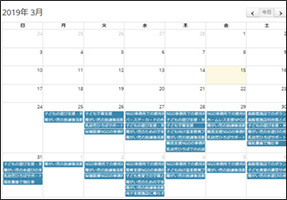 The Volunteer Web (provided by the Nippon Philanthropy Association) activity introduction and application system has been adopted as a means for providing volunteer opportunities. 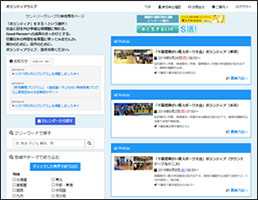 This system publishes volunteer activities in each region of Japan in a format where people can search for the type and date of activities they are interested in. In addition, the Let’s Cut Fabric and Picture Book Delivery international volunteer programs held in a limited number of locations up until now have been bundled into a package with the cooperation of NPOs, which has been published on the Volunteer Web and successfully been held in areas requested by our employees. We are taking initiatives to promote participation of our employees in volunteer activities such as planning company volunteer activities, cleaning windows or weeding at a social welfare organization that operates elderly care facilities and child daycare centers that is operated by Hojukai. New hires participate in volunteer activities at Domyoji Takadonoen, a general purpose welfare facility, as part of their training. As part of the Suntory Land of Water Kumamoto Support Project’s support for recovery after the Kumamoto Earthquake, we worked as operational volunteers and participated in the 25th Mashiki Aso Kumamoto Airport and Techno Area Jogging Fair Competition. Roughly 2,000 people came together as runners and volunteers in this large local event held after the earthquake. 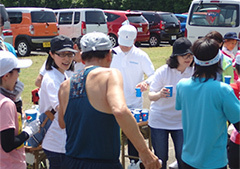 19 employees from each Suntory Group company participated with drinks and fruit handed out at water stations while locals cheered on the runners. 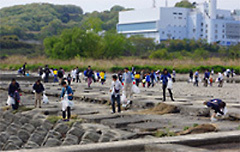 The Suntory Group's offices located around the country engage in environmental beautification efforts by cleaning up the vicinity and participating in garbage cleanups organized by local governments. 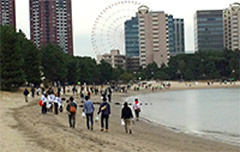 In 2015, Suntory participated in the Tokyo Bay Cleanup Campaign, which it has been supporting and co-sponsoring from 2003, with employees and family members joining local residents and businesses, and ultimately gathering roughly 80kg of litter. P LOVE GREEN -- Pronto Corp.
We announced the P LOVE GREEN campaign after reviewing the basic principles to become a junction to bring about creation for the future by providing peace and joy to the minds and bodies of customers as well as the origins of Green, which is the brand color of Pronto, in April 2010. This activity is a project unique to Pronto for the purpose of being kind to people and the environment while offering excitement that has been named P LOVE GREEN. This project broadens the provision of menus, goods, in-store environment, and entertainment and even community contribution activities. We also contributed to greenification business after the Great East Japan Earthquake, starting with donations to the Tokyo Green Project in fiscal 2010 as one of our activities. In 2012 and 2015, we received a gratitude letter from the Minister of Agriculture, Forestry, and Fisheries. In addition, we are conducting tree planting activities with the local children, such as tree planting for forests to prevent damage in areas affected by the Great East Japan Earthquake. Supporting the Kiritappu Wetland National Trust -- Häagen-Dazs Japan, Inc.
Häagen-Dazs Japan has been providing support for the Kiritappu Wetland National Trust in Hamanaka, Akkeshi since 2007 for the Konsen ward of Hokkaido, which is a production area of milk used as an ingredient for ice cream. Kiritappu Wetland has also been registered in Ramsar Convention in 1993 as the third largest wetland in Japan. Our employees are conducting volunteer activities to preserve the scenery of the wetlands by repairing the boardwalk together with the local people every year in addition to providing financial support. These volunteer activities are planned to be continued every year with 2017 being the 11th year of these activities. Supporting the Revitalization of Communities with Flowers -- Suntory Flowers Ltd.
Suntory Flowers is providing flowers for areas such as parks to allow even more people to experience a life in a community with flowers. The Red Flower Project has expanded throughout Japan since 2012 to play a role in revitalizing communities by planting flowers in parks and public facilities in each area of Japan under the slogan, "Revitalizing Japan with Red Flowers!" We donated Surfinia Red flowers to organization in each community in Japan. From 2015, we have expanded the scope of our activities even further to engage in "Big Flower Project".